A new free exhibition at the Coalbrookdale Gallery, adjacent to Enginuity near Ironbridge, aims to bring the excitement and intrigue of the Great Exhibition of 1851 to life. Open Monday to Friday from 10am until 5pm, Design and Desire: The Great Exhibition of 1851 will use objects and images, including prints and paintings from the Elton Collection, to tell the story of how it became one of the most influential and renowned events of the 19th century, breaking class boundaries and laying the foundations for a century of invention and modernity. Opening on 21st March 2016, it will run until 24th February 2017 (10am-5pm, Monday to Friday). The Great Exhibition of 1851 was the first international show of manufactured products. 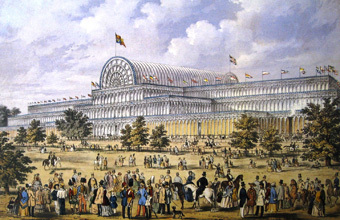 Organised by Henry Cole and Prince Albert, it was held in the revolutionary glass and iron 'Crystal Palace' in London's Hyde Park. After its closure many of the exhibited objects were used as the first collection for the South Kensington Museum which opened in 1857, and later became the Victoria and Albert Museum. Rather than focus solely on the 100,000 plus objects displayed from the British Empire and around the world, this display will also consider The Great Exhibition's impact on the popular imagination of the time. It will explore the reaction to the event in popular periodicals, prints and caricatures, its social and economic impact, and the ways in which the event was commercialised in the form of souvenirs. Additionally it will show the process of its creation and colossal design and explore what it would have been like to visit such a wondrous spectacle 165 years ago. For further information, contact the Ironbridge Tourist Information Centre on Tel: 01952 433 424 or visit http://www.ironbridge.org.uk. The Gorge is easily reached via the M6 and M54 motorways exiting at Telford (M54 junction 4 or 6).